Imagine lush meadows, still ponds and the most wonderful, colorful, fragrant roses you'll ever see or smell. During May and June-when Mother Nature reveals her magic and dull soil explodes into brilliant splendor-we make haste to welcome the season. We're excited by spring, eager for summer and all set to explore. What better way to seek tranquility than to be amid flowers and trees that keep secrets and inspire deep thoughts? Come along and traverse the area for those special places where butterflies dance and bountiful woodlands bring peace to the mind! Started in 1951, UNITY VILLAGE offers the visitor 1,400 acres containing fountains, a rose garden, two meditation gardens, and woodlands with walking paths and ponds that surround a natural preserve and nature prairie. A chapel bell tower chimes hourly and plays recitals several times daily. A popular site for outdoor weddings, the Unity Rose Garden contains more than 800 award-winning rose bushes of over 40 varieties. Many of the rose bushes were donated in memory of loved ones. May and June are great times to enjoy the Garden when the roses begin to bloom. The Unity Village compound is a retreat for those seeking spiritual inspiration and its non-denominational chapel welcomes all visitors. In fact, the Village does not charge for the many prayer requests received from those who call and write Silent Unity, a worldwide prayer ministry of Unity School. Just 35 minutes down the road from Unity Village lies POWELL GARDENS. This not-for-profit 10-year-old botanical garden is a scenic wonder set among 835 acres of lush rolling hills with display gardens, native grasses, nature trails and wild-flowers. The 3.5 acre perennial garden is the largest in the Midwest, with more than 5,000 plants. One area of the garden is designed to attract butterflies. 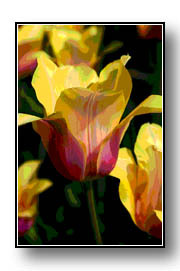 Daylillies are abundant, with more than 250 varieties. A path leads to the Rock and Waterfall Garden, 2.5 acres of natural landscaping with ornamental trees, shrubs and colorful blooms, including hundreds of azaleas. Nearby is the Meadow Pavilion, with wildflowers and natural grasses. 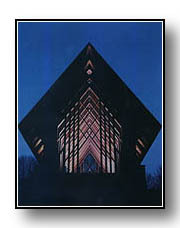 Powell Gardens offers unique, contemporary architecture by Fay Jones of Fayetteville, Arkansas, including the Marjorie Powell Allen Chapel, a non-denominational chapel open to visitors and available for weddings. Jones also designed the $6.5 million Visitors Education Center, an 18,000 sq. ft. structure overlooking a lake and made of limestone and wood. It houses year-round floral exhibits, art displays, lectures, special events, a cafe and gift shop. Powell Gardens, located 30 miles southeast of Kansas City on Hwy. 50. During the peak season, Powell Gardens charges adults $5, seniors $4 and children $2, with a family maximum of $15. For more information, call (816) 697-2600. 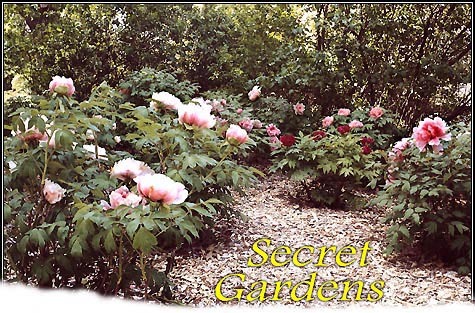 The LINDA HALL LIBRARY, adjacent to the UMKC Campus at 5109 Cherry Street in Kansas City, Missouri, is a 51-year-old urban arboretum with 14 acres of green space and one of the largest collections of tree peonies in the midwest. With eight inch blooms in all colors, tree peonies begin blooming in late April and continue blooming through May. A specific section of the grounds was designed to attract butterflies by providing nectar and habitat. Colorful zinnias, mari-golds and shasta daisies, along with Mexican sunflowers, parsley and fennel, attract butterflies in spring and monarchs in autumn. Also on the grounds are antique shrub roses with fragrant flowers that bloom in May and June and a new area of nature prairie plants that offers over 50 species of indigenous perennials. Shade can be found under the 450 or more trees representing 160 varieties. Tours can be arranged. 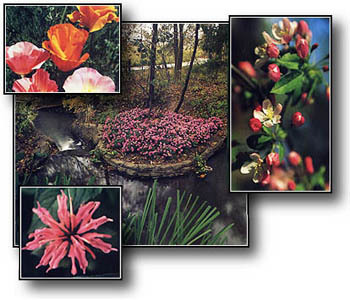 Printed guides to the arboretum and gardens are available at the front desk inside the library for $5. For more information, call (816) 926-8747. The HELEN CUDDY MEMORIAL ROSE GARDEN, at 6501 Antioch in Shawnee, Kansas, is located inside the 44-acre Antioch Park where one finds all the rose bushes that the late centenarian Helen Cuddy loved so much. The Rose Garden is part of the Memorial Arboretum, which features 625 rose bushes and a cascading fountain, an Iris garden and a mixed bed of colorful flowers. A perennial bed is also inside the arboretum and contains lamb's ear, hibiscus, crocus, grape hyacinths and different kinds of grasses. Weddings can be booked for a small fee and rose bushes can be donated in memory of loved ones. The park is also a great place for outings, with many picnic tables, trees, a small lake with stepping stones and geese and a fantastic play land for children. For more information, call (913) 831-3355. Located at 13800 Switzer Road in Overland Park, KS, the DEANNA ROSE CHILDREN'S FARMSTEAD has lots of big and little animals to pet and feed, along with ponds, wagon train rides and old farm implements. But don't be fooled by its name, this 23-year-old, five (soon to be seven) acre park featuring gardens, grasses and flowers maintained by the Johnson County Extension Master Gardeners not only delights visitors, but also educates and demonstrates the latest techniques and varieties in gardening. Named after a police officer who was fatally shot in line of duty in 1985, the farmstead has annuals, bulbs and other flowers beside old farm implements. The old-fashioned garden, surrounded by a white picket fence, contains farm crops, a butterfly garden with a butterfly house, a vegetable patch and a maze of winding brick walkways. It also features flowers for low water maintenance, herbs, ground covers and a shade garden containing columbine, hostas, bleeding hearts and lilies. Also located in Overland Park, Kansas is the OVERLAND PARK ARBORETUM & BOTANICAL GARDENS, found at 179th Street one-half mile west of U.S. 69. Although this 300-acre park was opened by the city in 1900, the park's emphasis is on the eight natural eco-systems that surround the miles of trails available for nature lovers to enjoy. Plants to come include a Prairie Medicine Garden, a Discovery Garden for children and an old English-type maze with shrubs to create a secret garden effect. But the highlight is the Erickson Water Garden with four water falls and a bog area with over 100 natural plantings designed to attract birds and butterflies. Such plants as wild flowers, buddleia and milk weed along with Indian grasses and ecchinaacea are there to enjoy while you walk or picnic-a great thing to do since the arboretum has many tables and grills and a pavilion that can be reserved in advance. The secret is out! 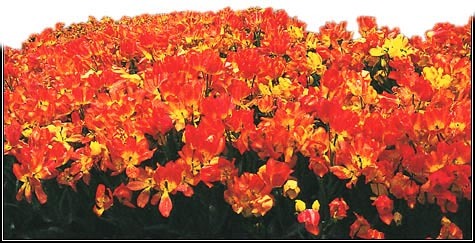 The metropolitan area is booming with undiscovered floral treasures just waiting to be explored. Retreat to one of these magical, colorful gardens and enjoy the beautiful gift Mother Nature has given us.